A set of 52 Black and White Glass Lantern Slides, c.1940 originally compiled by the British Red Cross and St. John War Organisation now form part of the Red Cross collection ‘A Gift to the Nation’ including Australian Red Cross national and Victorian archives transferred to the University of Melbourne Archives in 2016. Lantern slides are positive transparent images of photographs on glass that can be projected onto a wall using a Magic Lantern, a format developed in the nineteenth century as a visual aid to entertain and educate. The University of Melbourne Archives holds many sets of Glass Lantern Slides, the majority once used as visual teaching aids in various University faculties and now of interest to students studying the history of photography and Cultural Materials Conservation among other research. 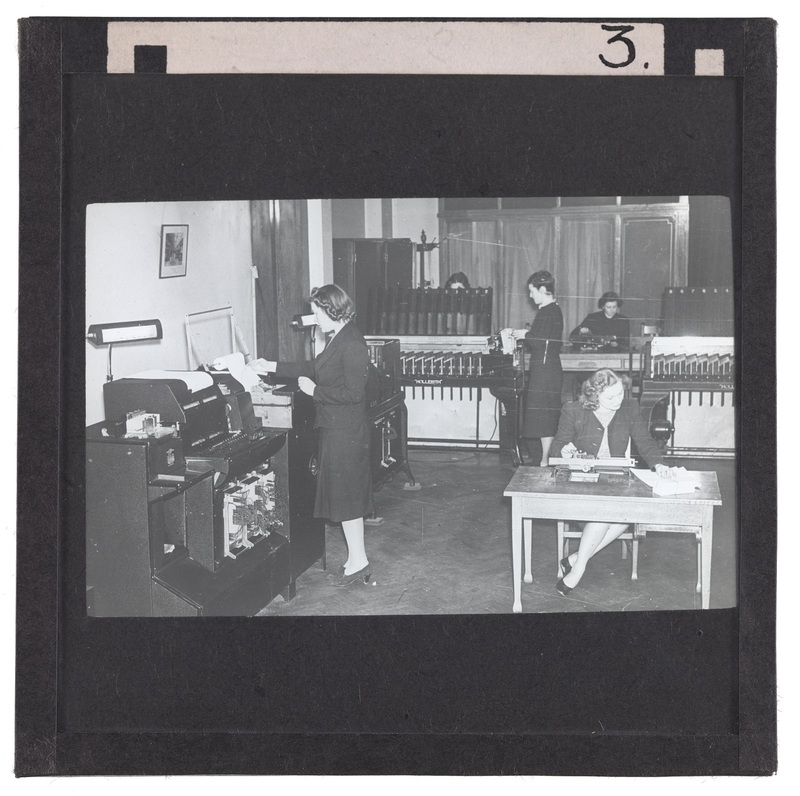 This set of Red Cross Glass Lantern Slides comprises images of their activities in WW2 and were used by the Red Cross to explain the complexity and demonstrate the scope of their work for the purpose of recruitment, fundraising and information. Slides show the administrative complexity of the Bureau for Wounded, Missing and Prisoners of War which had a number of Hollerith machines to assist in vast administrative functions in calculating the thousands of POWs; the inspection of allied POW camps to ensure the rules of the Geneva Convention were being met; providing medical supplies as well as food, books and clothing packages to prisoners. The images also show sporting and recreational activities as well as labouring on roads. 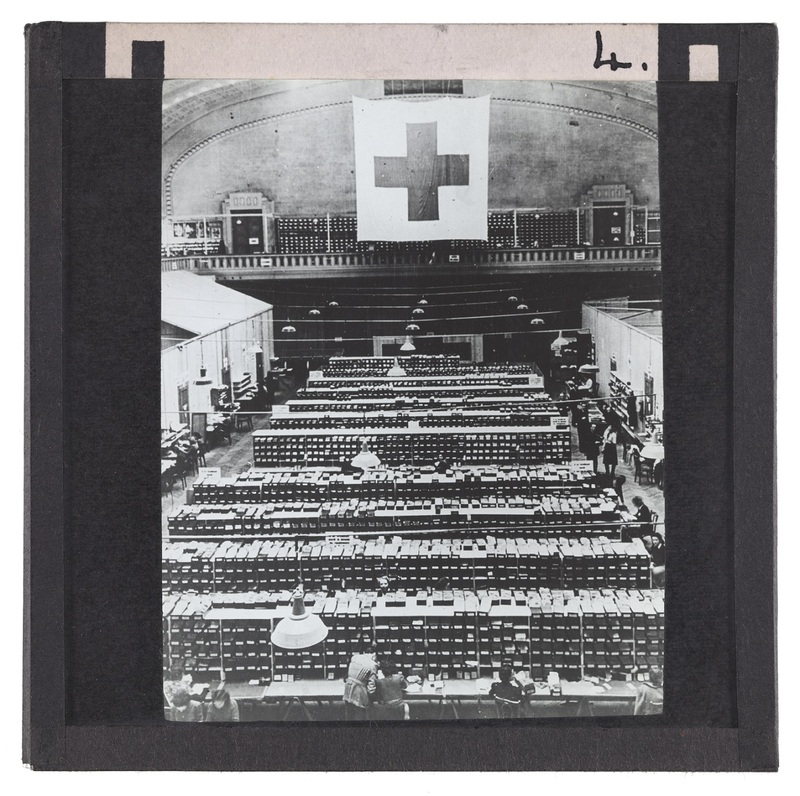 To mark World Red Cross Day and the transfer of most of the Red Cross Archive to the University of Melbourne Archives, we are publishing a series of guest posts on our blog. These stories showcase the breadth of the collection. The slides also provide visual context to other records in the collection such as the series of POW index cards, ‘Missing, Wounded and Prisoner of War Enquiry Cards’. There are over 60,000 cards, about 95% of which date from World War Two. These cards have recently been digitised and will be available online by the end of May 2017.